The Lynden Tribune newspaper made the decision to publish a December 23, 2015 opinion piece submitted by Chair John Huntley and President Brad Owens of the Northwest Jobs Alliance (NWJA). The NWJA advocates for the proposed Gateway Pacific Terminal (GPT) project. Their op-ed leveled unsubstantiated, defamatory allegations at unnamed “leadership” of the Lummi Nation, a self-governing Indian Nation, and those allegations could easily be perceived as having been leveled at Lummi Nation as a whole. The Lummi, a Coast Salish people, are the original inhabitants of Washington state’s northernmost coast and southern British Columbia. The Lummi Reservation is located in western Whatcom County, and it is governed by the Lummi Indian Business Council (LIBC), an eleven member tribal council. NWJA’s December 23, 2015 Lynden Tribune op-ed claimed that “the current leadership of the Lummi Nation has embarked upon a campaign against the working families of Whatcom County.” In an attempt to support that inflammatory claim, NWJA pointed to a December 10, 2015 letter from Kirk Vinish of the Lummi Nation’s Planning Department. However, a review of that 2-page letter produced no evidence to support such a claim. In contrast, NWJA has left a trail of evidence demonstrating its continued pattern of negative messaging to raise resentment about, and discredit, the Lummi Nation’s opposition to GPT by sending accusatory letters to the Army Corps and Whatcom County, and by disseminating similar accusatory messaging to the public, via the NWJA email list and a press release sent to local media. In NWJA’s opinion piece, Huntley and Owens also alleged that Lummi Nation leaders are proposing the elimination of existing Cherry Point industry jobs. They provided no evidence whatsoever to support such a claim. As if it weren’t bad enough that NWJA submitted its defamatory op-ed for publication in a local newspaper, the Alliance launched a second strike aimed at Lummi Nation leadership the day before, by submitting a December 22 comment letter to the Whatcom County Planning Commission, on the currently ongoing Whatcom County Comprehensive Plan Update. The comment letter was a slightly revised version of NWJA’s op-ed published in the Lynden Tribune, containing the same unsubstantiated accusations. NWJA’s inflammatory comment letter is now part of the official public comment record for the County Comprehensive Plan Update which the Whatcom County Council will review prior to voting on the final language to be included in the plan update. The fact that the Council is also one of the decision makers on permits needed by PIT for its GPT project makes NWJA’s comment letter “comprehensively” reprehensible. GPT would be sited along the Salish Sea shoreline, at Xwe’chi’eXen, part of the Lummi Nation’s traditional fishing area. Xwe’chi’eXen is the Lummi peoples’ ancestral name for Cherry Point, an area which has a deep cultural, historic and spiritual significance to the Lummi people, as it was a village site for their ancestors for over 175 generations. The projected coal export terminal threatens Lummi treaty rights, the salmon they depend on, their Schelangen (“Way of Life”), and the cultural integrity of Xwe’chi’eXen. LIBC Chairman Tim Ballew II sent a January 5, 2015 letter to the U.S. Army Corps of Engineers Seattle District Commander, Colonel John G. Buck, asking the agency to take immediate action to deny the GPT permit application. In that letter, Chairman Ballew stated that the GPT project “will directly result in a substantial impairment of the treaty rights of the Lummi Nation throughout the Nation’s ‘usual and accustomed’ fishing areas.” Ballew also wrote that “The Lummi Nation is opposed to this project due to the cultural and spiritual significance of Xwe’chi’eXen, and intends to use all means necessary to protect it.” He added that the Lummi Nation has a sacred obligation to protect Xwe’chi’eXen based on that significance. The U.S. Army Corps of Engineers (“the Corps”) is the federal agency tasked with coordinating and handling the environmental review for the GPT project, and it is legally obligated to ensure that the Lummi Nation’s treaty rights are protected, and are not violated. Currently, the Corps is in the process of making a determination as to whether impacts to any tribes’ U&A (usual and accustomed) treaty fishing rights are more than de minimis, meaning too small or trivial to warrant legal review. The Northwest Jobs Alliance (NWJA) was created to promote and advocate for the GPT project. For the first few years, NWJA consisted solely of a Facebook page, after that page had been created in May of 2011. NWJA’s original mission statement that had been displayed for years on its Facebook page read: “The Alliance focuses their efforts on supporting the Gateway Pacific Terminal. . .” For almost three years, NWJA’s Facebook page showed “www.gatewaypacificterminal.com” as its website address, and the phone number displayed had been a non-working number. Presently, the NWJA website states the following as its mission: “The Northwest Jobs Alliance (NWJA) promotes the growth of family-wage jobs in the context of sound environmental practice.” Also, there is no mention of GPT on the NWJA website’s Home page where the organization’s mission and focus are explained. Instead the general term “Cherry Point industrial area” is used. On October 23, 2014, NWJA was filed as a non-profit corporation, according to the Washington Secretary of State website. SSA Marine’s paid local consultant for the GPT project, Bellingham resident Craig Cole, is the listed Director for NWJA. Since its inception, NWJA has had a steady turnover of co-chairs, all of whom have been very public advocates for the GPT project. Presently, Brad Owens is listed as NWJA President and John Huntley is listed as NWJA Chair. Huntley owns Mills Electric, a Bellingham electrical contracting company. Owens, a Bellingham resident, is the past President of the NW Washington Building & Construction Trades Council. Some people confuse the “Northwest Jobs Alliance” for another similarly titled GPT advocacy organization called the “Alliance for Northwest Jobs and Exports.” It’s worthwhile to distinguish between the two, although promoting the GPT project has been the central intended purpose of both groups. The Alliance for Northwest Jobs and Exports (ANWJE) was first presented to the public as a grass-roots organization, when it was actually created in 2012, by Edelman, the world’s largest public relations firm, which was hired by SSA Marine to do public relations work for the proposed GPT project. BNSF Railway, SSA Marine, and Cloud Peak Energy are listed on the ANWJE’s membership list, which is comprised of companies and other entities which stand to benefit financially from the coal export terminal. So, this “non-profit trade organization” was created by the public relations firm hired by the GPT applicant, and it is governed by an employee of BNSF, the applicant for the interrelated Custer Spur project, and by an employee of Cloud Peak Energy, which has a 49% stake in SSA Marine/PIT’s GPT project. Joining in those activities against Lummi opposition to GPT, was the Political Action Committee SAVEWhatcom, headed up by Halterman, whose name pops up in most everything GPT-related. The SAVEWhatcom PAC was the vehicle for Gateway Pacific coal terminal interests to fund 2013 and 2014 local Whatcom County election political campaigns with over $160,000, which, if successful, would benefit those interests. One month after the LIBC’s January 5, 2015 letter to the Corps, Halterman’s SAVEWhatcom placed a February 5 post on its Facebook page which disparaged the Lummi Nation and its Silver Reef Casino in what appeared to be an attempt to drive public opinion against the Lummi Nation’s strong oppositional stance to GPT. 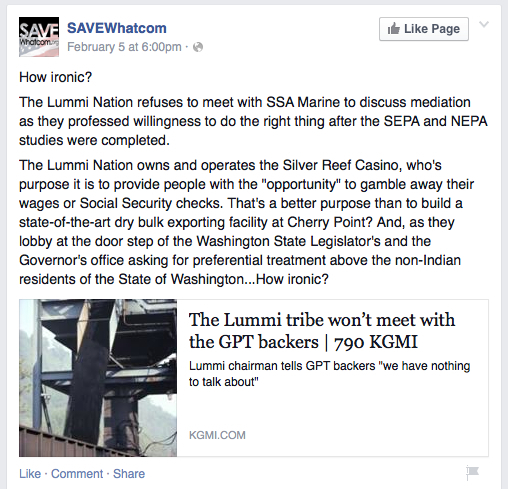 Those specific repeated references to the Lummi Nation’s Silver Reef Casino and enterprises by SAVEWhatcom and the SSA Marine consultant-led NWJA, could be viewed as attempts to drive public opinion against the Lummi Nation’s Silver Reef enterprises—trying to change the minds of the Silver Reef’s loyal patrons who enjoy the hotel, spa, casino, entertainment/shows, multiple restaurants, convention and event venue, and more. NWJA’s December 23 opinion piece failed to mention that the Lummi Nation’s Silver Reef Hotel Casino & Spa employs 675 people. It also failed to mention any of the significant contributions from the Lummi Nation to Whatcom County’s community at large, which certainly have a positive impact on countless families and individuals in Whatcom County. For example, LIBC Chairman Tim Ballew stated in a May 2015 piece in The Bellingham Herald, that Lummi Nation was “humbled and honored to be able to give back to the people who work so hard to make our community thrive,” when referring to its Nation’s donations of over $600,000 awarded to 43 organizations. Some of those organizations include the Bellingham Food Bank, the Whatcom Literacy Council, and Whatcom County Fire District 8, to name a few. NWJA stated in its December 23 op-ed and its December 22 comment letter to the County Planning Commission, that “Whatcom County ranks 30th out of 39 counties for personal income growth [Bellingham Herald 11/19/15].” In reading The Bellingham Herald article cited as a source for that statistic, NWJA did not bother to inform readers that while the per capita personal income average in Whatcom County increased 3.2% from 2013 to 2014, placing it 30th out of 39 counties in the state, Whatcom County’s 2014 per capita income total ranks 16th highest out of Washington’s 39 counties. “This echoes previous requests that the Lummi have made to the County to begin phasing out the Cherry Point heavy industrial zone.” No evidence, however, was provided by the NWJA to show any previous, or even current, requests from Lummi Nation to begin phasing out the Cherry Point heavy industrial zone. 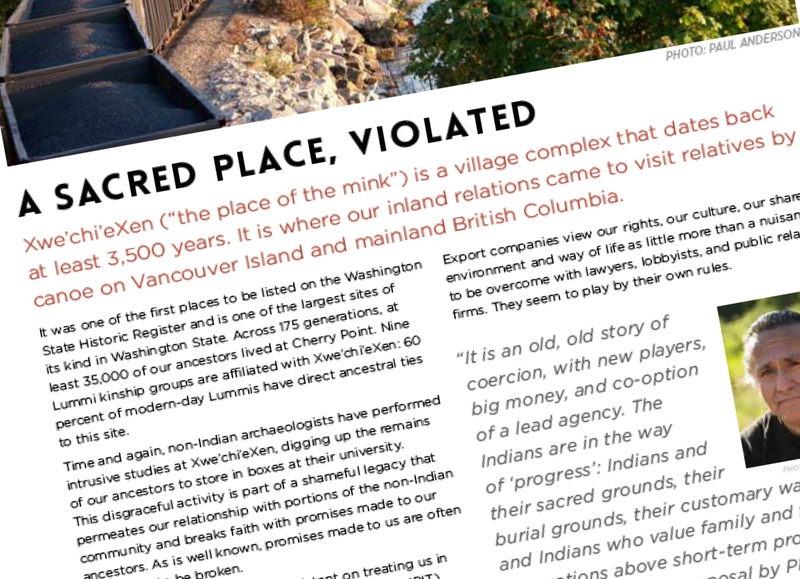 NWJA repeated similar statements in its August 27, 2015 email advertisement disseminated via its mailing list, and in its September 10, 2015 press release, potentially indicating to their audiences a reason to marginalize and dismiss Lummi Nation’s voice based on the Lummi’s minority population status. Just as “Manifest Destiny” mandated that it was supposedly God’s providence that the U.S. should exercise hegemony over its neighbors—seeing North America as the new Promised Land, NWJA and the GPT corporate interests they advocate for, seem to believe that it’s their economic providence to exercise hegemony over the Lummi Nation—seeing Xwe’chi’eXen (Cherry Point) and its naturally occurring deep-water contours which allow for huge Capesize vessels stuffed with U.S. coal bound for Asia, as their new Promised Land. The Lummi Nation, however, and countless people in the Pacific Northwest region, have a very different view of their destiny, and that view does not include the transporting, handling, and shipping of 48 million metric tons per year of coal to Asia, which is the plan for GPT. Raising resentment of tribal treaty rights; encouraging the public and government officials to ignore tribal treaty rights; calling into question the motivation behind an Indian Nation’s exercising of its tribal treaty rights; interfering with the federal regulatory review process and the government to government relationship between a U.S. federal agency and Indian Tribes and Indian Nations; and making disparaging and unsubstantiated accusations against an Indian Nation and its leaders, are some of the various ways in which the Lummi Nation is being attacked as powerful corporations endeavor to realize their perceived manifest destinies, in pursuit of a coal export terminal at Xwe’chi’eXen. ← What Do Coal Port Interests’ Clear Choices Mean? Organized racism by organized labor — in cahoots with the Tea Party and major corporations — is something that ought to concern local and regional human rights organizations. Indeed, this concern compelled me and others to publish articles, commentary and special reports over the last three years. As an associate scholar of the Olympia-based Center for World Indigenous Studies — the publisher of IC Magazine — I have alerted the Affiliated Tribes of Northwest Indians regarding the ongoing Gateway Pacific Terminal-sponsored racism targeting them and Lummi Nation for opposing fossil fuel export on the Salish Sea. As a think tank established by leaders of the National Congress of American Indians in the US and the Assembly of First Nations in Canada, CWIS in 1996 hosted a conference along with ATNI and the Northwest Indian Fisheries Commission titled The Politics of Land and Bigotry, to “join public policy activists and representatives of Indian nations in a dialogue about the portentous movements in America intent on promoting interracial discord.” Twenty years later, this topic is once again apropos. All of us who know the author, Sandy Robson, are aware of the issues she has iterated here in great detail. I just hope readers of the NWJA’s misinformation campaign will read this story. Or will they take the corporate-fed ideology of NWJA spokesmen on blind faith. Dena Jensen, in her blog, Coal Stop, has once again published an excellent article by Sandy Robson. “The Ugly Underbelly of Corporations’ Pursuit of a Coal Terminal,” puts into a clear picture the many disparate pieces of propagandist material relating to the Lummi people who oppose the proposed SSA Marine coal terminal by defending their treaty rights. Hidden under the belly of supposed op-eds, comments, letters, reports, presentations, emails, press releases, and God knows what else–maybe even in box lunches– are these newest pox. This article again reminds me of my responsibility to speak up. Not only are the issues above poignant from the perspective of “one man’s need is not a claim on another man’s property,” but we are also stewards for those and that which cannot speak to us or move us until it is too late; until we see and live the destruction. The proposed coal terminal at Cherry Point will destroy everything in its path…polluting the water with chemicals and noise, which will kill Orca and Salmon, both already struggling. They are, respectively, the Apex predator of the sea, and a keystone animal for the planet’s health. Washington State must speak up for itself and the world by promoting new business ideas that improve the health of all living creatures and habitats. No More Coal. Promote innovation in energy!! We must support free enterprise ideas that treat the planet with the deepest respect possible. Let us not forget or squander the best of what is truly American – The freedom to innovate. Please share this article on your Facebook pages. Devote as much time to spreading important information as you do to lesser impactful pastimes. Like twenty years ago, when organized racism tore Northwest communities apart, what is required is an organized community response that uses research as an organizing tool. For three years, Sandy’s investigative journalism has documented the people and methods behind this industrial-sponsored terrorism; now it’s time to put that information to good use. The only thing missing is leadership capable of organizing concerned citizens in mounting an effective opposition to racism sponsored by GPT, KGMI, NWJA and the Tea Party. Thank you to you all who have commented here, so far, on this article. I appreciate your input. As Jay Taber mentions in his comment, I have been writing about the Gateway Pacific Terminal for about the last three years. I am hoping that this information (and the other articles I have written about GPT) get out to as many people as possible and that they share that information with others. Our local daily newspaper The Bellingham Herald does not cover much of what is actually happening with GPT so the general public is receiving very limited information. What the NWJA has been doing to the Lummi Nation certainly appears to be a campaign against Lummi Nation and its leaders in response to their Nation having exercised their treaty rights relating to the proposed GPT project in January 2015. Thank you all who read this article for paying attention to what has been happening. I think that the elusive members of the upright, forthright, stolid and stalwart American values group called “working class families” by the GPT propagandists would or should be absolutely appalled to have these liars (Northwest Jobs Alliance) speaking for them. How long will the public remain silent while the Lynden Tribune abrogates its responsibilities as a news gathering press in order to remain a mouthpiece for manufacturing public consent and silence here in Whatcom County, the all-important “thin green line”( http://www.sightline.org/2014/09/22/event-the-thin-green-line-in-bellingham/)? The fishing families, boat builders, fisheries equipment suppliers, seafood processors and tourism-related workers would likely agree. One fossil fuel shipping disaster would put thousands of local working class families out of work.